No, this is not a new prairie flower and I did not plant him there. This man was shoulder deep in my prairie because he was replacing a portion of the sewer line that connects my house to the main sewer line. I think he was admiring the four nerve daisies in this picture. City contractors have been working around the neighborhood since September to upgrade the main sewer line and install new connections to the houses. I was not too concerned about the upgrades until I saw a backhoe digging a deep ditch 10 feet into a neighbor's yard one street over. I panicked a little because I have several plants in my yard that would not be as easy to replace as my neighbor's St. Augustine lawns. The contractors kept the neighborhood updated on the progress of the upgrades with door flyers that included contact numbers, so I called the crew foreman, Bobby, to explain the uniqueness of my yard. I asked that if he could tell me where they needed to dig, I could remove the important plants from that area. He told me something to the effect of "I'll take care of you." Over the course of three months, I talked to the foreman at least three times. He said he had a couple of ideas, but he still never told me where they would need to dig. I remained apprehensive. This morning there were workers on my street and I asked one if he could tell me where they needed to dig in my yard. He said his supervisor decided they would do most of the work under the public sidewalk and they would only need to dig a few feet into my yard. This was good news because there were not many plants growing in this area. So I moved mulch out of the way and dug out a few plants that I did not want damaged. At the end of the day, I have minimal damage to plants and a sewer access port. The workers even replaced the mulch I moved. Thanks Dig Tec and Bobby. Note: This picture is a little blurry because I was juggling a camera and an umbrella. Yes, it was raining! So the moral of this story is that if you are polite and ask for consideration of your landscape, you might actually get some. My last post covered written prairie inspiration. For this post, I thought I would share some of my favorite photos from 2011...the results of my prairie inspiration. Notice there are no photos from mid-June through mid-September. This was the time that summer heat and drought reigned and the prairie went to sleep. But, oh boy, did it wake up in late September after the heat wave broke and a little rain fell from the sky. 12-03-11. Cold temperatures gave the normally pure white Datura wrightii flowers a purple tinge. This is the most purple I have ever seen on these flowers. I know most other garden bloggers posted their favorite 2011 photos at the first of the year. I am a little slow at this blogging thing. I have also spent many of my free daylight hours in the yard. This dry and warmish winter been great for working on projects (removing grass, digging trenches for drainage pipes, adding pathways) and moving plants so they have time grow some roots before summer. 2012 promises (threatens?) to be a drier year than 2011. Despite occasional rains, lake levels have remained low. So low that we are expecting to go into Stage 4 watering restrictions soon. This will mean no outside watering and a true test of the resiliency of my prairie plantings. A few years ago, I was in a used book store and flipped through The Prairie Garden: 70 Native Plants You Can Grow in Town or Country by J. Robert Smith and Beatrice S. Smith. 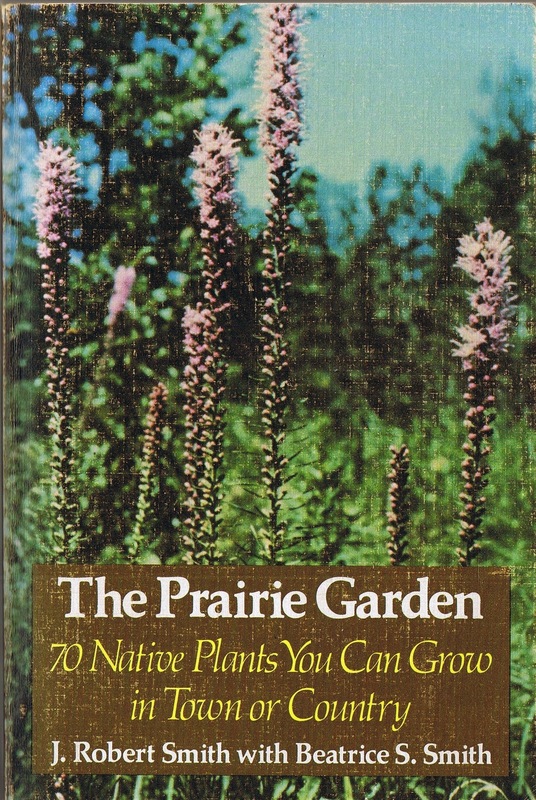 The book was published in 1980 by the University of Wisconsin Press and covers planning, planting, maintaining a prairie garden on a large or small scale. 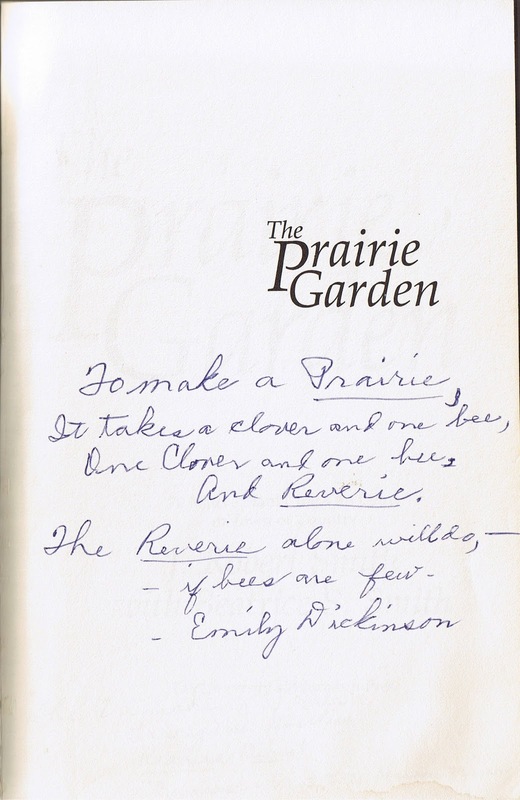 Although the book is written from a northern prairie perspective, the principles can be adapted to Texas gardens. 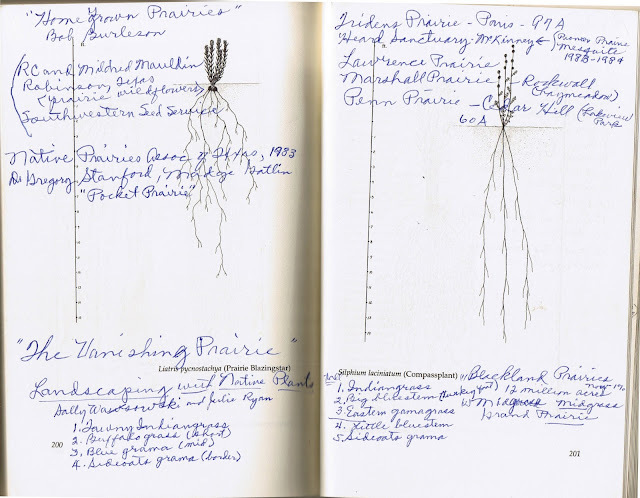 Additionally, several of the seventy prairie plants profiled in the book are also native to Texas. The printed text by the Smiths is informative and makes this book worth reading for anyone considering a prairie garden, but it is the handwriting left by the unknown, previous owner of this particular book that make it special and inspiring. 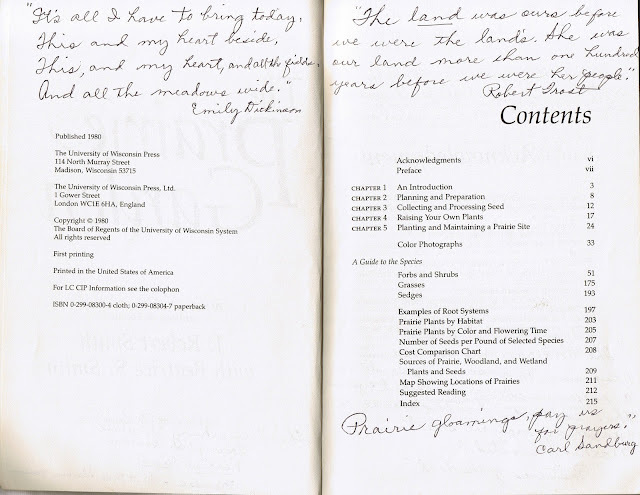 From the title page to the blank pages at the end of the book, the previous owner filled this well read book with quotes and notes about prairies, meadows, and nature. This poem by Emily Dickinson is a fitting addition to the title page of the book. Here is a sampling some of the other embellishments the prior owner added to the book. Buttercups and clovers, grasses growing tall. Each is part of music, vibrant in the air. Gentle upward motion; growth is constant there. Covering me in sunshine, checkered by the shade. I look into heaven, thrilled and unafraid. The previous owner of the book obviously lived in Texas. 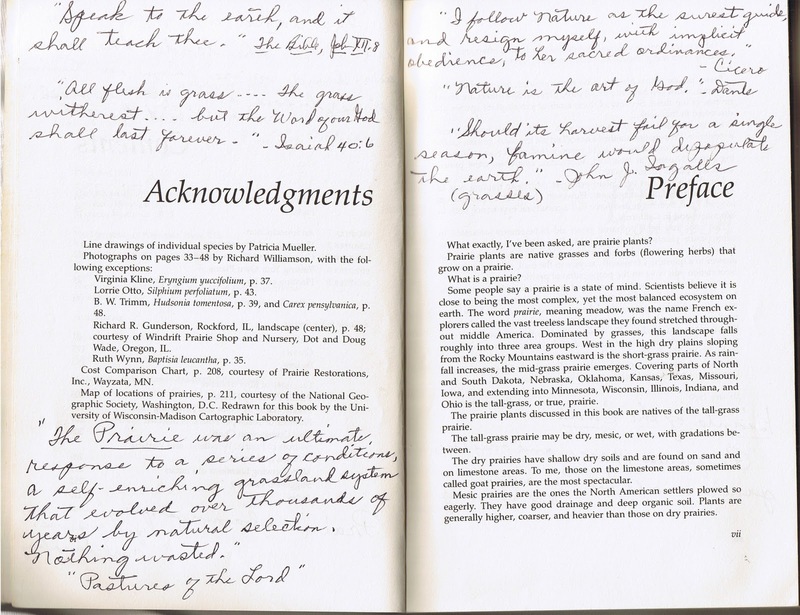 These pages reference the names of people, such as Bob Burleson and R. C. and Mildred Mauldin, that were active in the promotion of native plants and restoration of prairies in Texas 30 years ago. Geoffrey (rather than Gregory) Stanford was a past president of Native Prairies Association of Texas. 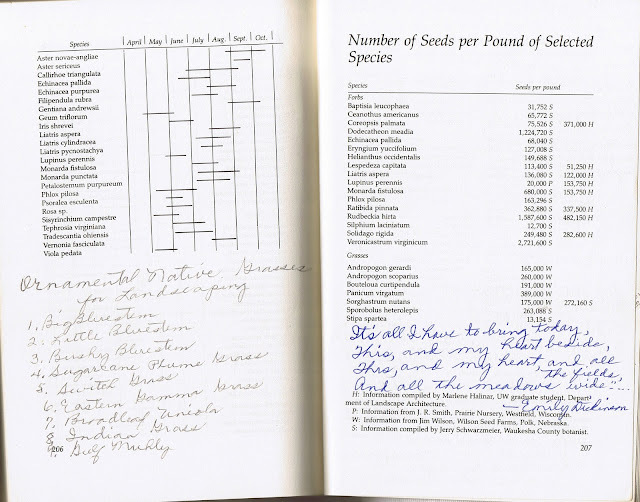 Sally Wasowski wrote several books on landscaping with native plants and I own several of them. Disney's Oscar winning 1954 documentary The Vanishing Prairie can be streamed online. I remember enjoying this movie in elementary school. I watched it again recently. It was dated, but still somewhat entertaining. There are also names of north Texas prairies on these pages. It appears that the Tridens Prairie in Paris is still around. The Penn Prairie in Cedar Hill appears to be part of the Cedar Hill State Park. The Heard Museum is still active in McKinney. I could not find any online references to the Lawrence and Marshall Prairies. Were they developed and paved over? 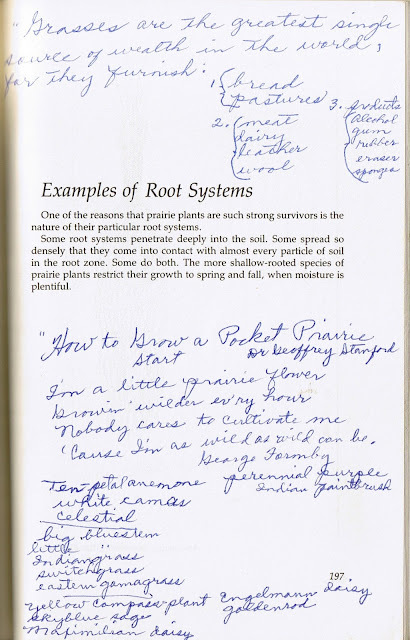 The prior owner of this book clearly had a passion for prairies and grasses. I can't help but wonder what this person did with their passion for the prairies. This page lists nine Ornamental Native Grasses for Landscaping. Another page, not shown, lists 39 prairie plants. I wonder if the writer ever planted any of these plants in their garden? 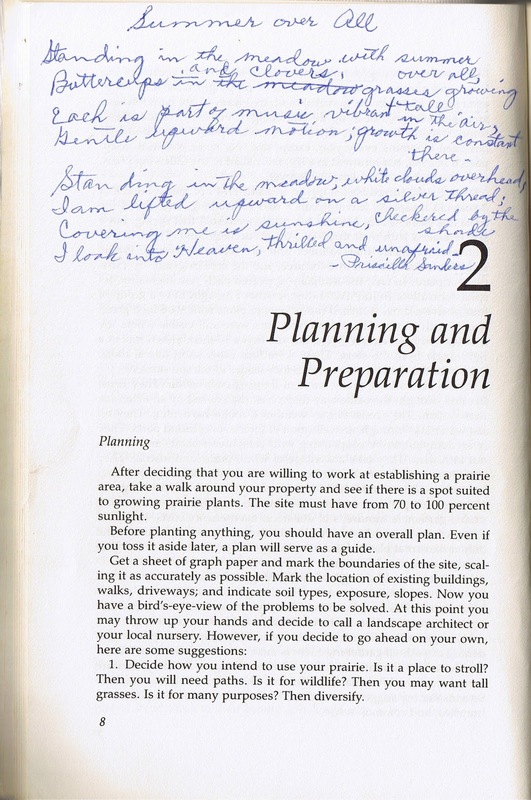 Based on the handwriting, my guess is that the writer was an older person and this book was sold after they died. I can't imagine that the prior owner would voluntarily part with this book after putting so much effort into research and documentation. 'Cause I'm as wild as wild can be. 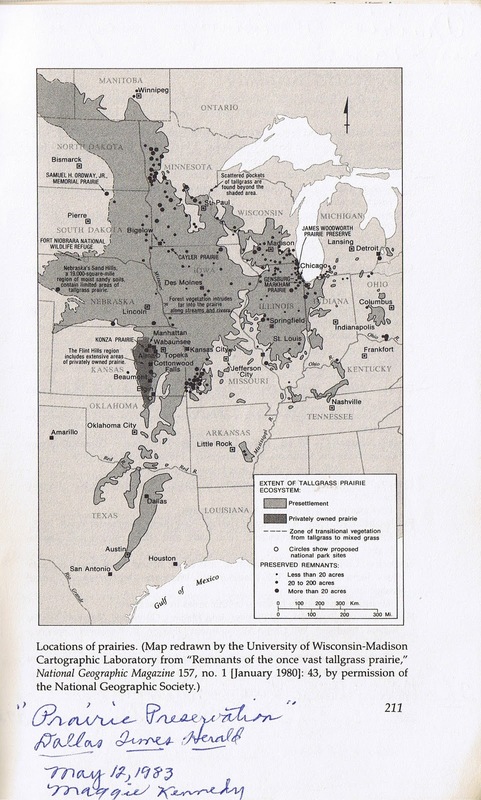 Most of the original prairies have been lost to farming, overgrazing, and development. Some estimate that less than 1% of the 20 million acres of Texas tallgrass prairies remain and only .004% of the Blackland Prairies remain. We will never again see the vast open spaces of prairies that once covered this continent's midsection. Fortunately, there are private landowners and groups that are inspired to preserve or restore the remaining prairies. Additionally, more people are recognizing the value and beauty of prairie plants and are inspired to incorporate them into their landscapes as specimen plants or in dedicated prairie beds. Some of us extremists were inspired enough to remove our lawns and replace them with prairie plants. 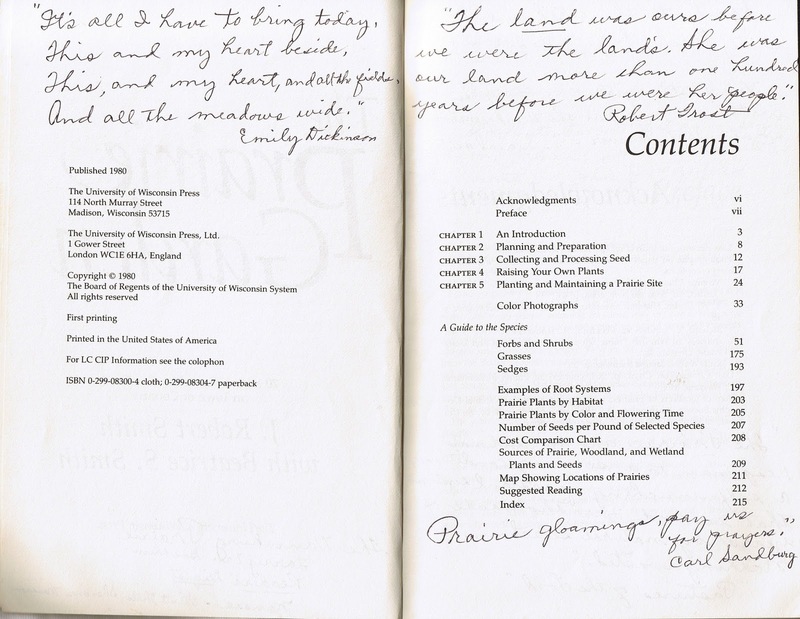 A couple of side notes: While trying to identify people referenced in the book, I came across the site for The Texas Legacy Project. This site features many raw video interviews of people that made some sort of impact on the Texas environment. Most of the interviews I sampled were in two one hour parts. 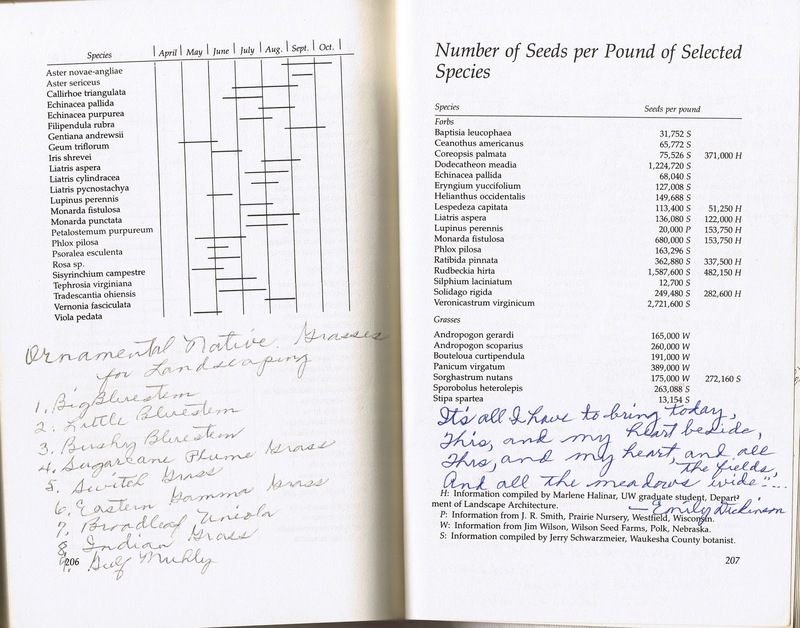 Included are interviews with Bob and Mickey Burleson (Burleson Prairie), David Bamberger (Selah Bamberger Ranch Preserve), and Bill Neiman (Native American Seed). 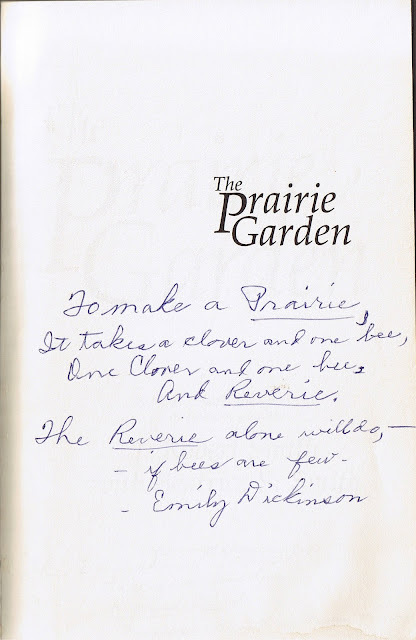 I also found out that J. Robert Smith, the author of the book, ran a nursery in his backyard called Prairie Nursery. When J. Robert Smith retired, he sold the operation to Neil Diboll who is known for his promotion of native plants in the landscape. Finally, I hope I did not violate any copyrights. If I did, please let me know and I will make the appropriate citations or remove copyrighted material.